Part 4 here. Throughout this series, we’ve mentioned the difference between positive reactions to temporary, Carnival-esque cross-dressing and the transphobic and especially transmisogynistic negative reactions experienced by people who cross-dress more permanently or who are transgender. 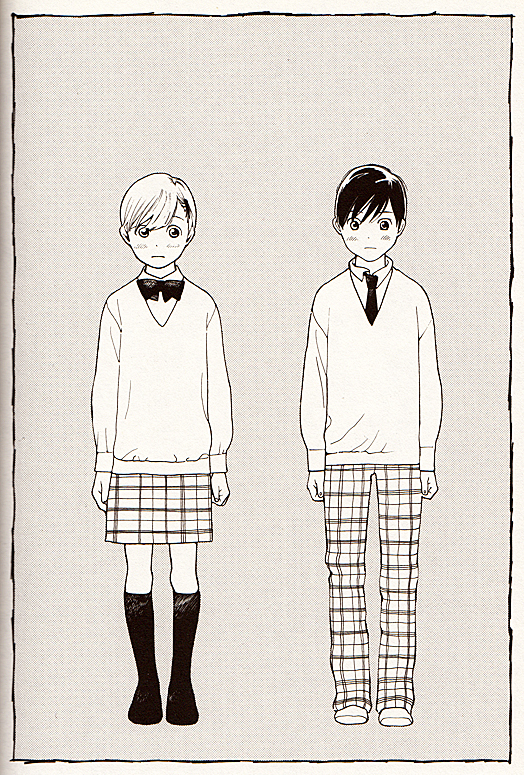 One of the best illustrations of this is Shimura Takako’s Wandering Son (Hôrô Musuko,「 放浪息子」), a manga and anime that feature several characters who are perceived to be cross-dressing by their community, when in fact several of them are dressing toward their gender identity (not cross-dressing). The show also features instances of socially acceptable cross-dressing (theatre) as a contrast to the transmisogyny experienced by an adult trans woman and a child designated male at birth (DMAB) on the cusp of puberty. In this section, we’ll be discussing a manga and anime in which trans characters dressing toward their gender identity are perceived as cross-dressing, and will be using the terms “girls’ clothes” and “boys’ clothes” a lot. Please keep in mind that we mean this in the sense of culturally gendered clothing and school uniforms in a narrative about minors who are not out and who have to deal with transphobia in their schools and homes. An article of clothing itself, as comedian Eddie Izzard comments, is not inherently gendered, though the intent for it to be worn by (certain) cisgendered bodies is present. Content warning: this section contains discussions of transphobia, transmisogyny, and sexism. There are also major spoilers for the anime and manga. To briefly introduce the characters, Nitori Shûichi1 is a preteen who was designated male at birth and identifies as a girl. Her friend Takatsuki Yoshino is DFAB and identifies as a boy during elementary and junior high school.2 The manga follows Nitori and Takatsuki as they graduate elementary school, begin junior high school, and eventually enter high school; the anime focuses only on them in junior high school. If you missed it last month, Miri of Brute Reason (Free Thought Blogs) has a post on how critiquing flaws in our theories can lead to a stronger, more holistic approach to discussing gender, culture, and feminism. I was initially a bit worried about the “devil’s advocate” position mentioned in the caveats because when I experience that position with critiquing (current) feminist theory, it tends to come with a tip of the fedora. However, this is the right sort of challenging and engaging and comes from a place of hoping to better the field.